In my last post I boldly claimed to take you by the hand for a stroll in the fourth dimension. Judging by the high number of views, but not so many likes, I suspect that a healthy degree of skepticism has won the day. And that is how it should be. I’m the first to agree that in this blog I will drag you into forests of confusion just to show you an exotic flower. But this post in which I explained that we live in a world of fractal dimensions, as in 2.78 or 3.54 rather than just 3; where I suggest that your eyes don’t actually see three dimensions but a little less and where I suggested a DIY experiment for seeing into the fourth dimension, in that post, actually, I was being coldly serious. Therefore, I feel compelled to get a little more techie on you and present a few dimensional nuts and bolts. I will try to avoid turning this into a lecture; you are here for light and pleasant reading after all. The whole notion of dimensions is a little confusing and for much of our human existence we have lived quite happily without it. In fact, it is only in recent centuries that artists have painted images with convincing three dimensional perspectives and shadows. This wasn’t just because they didn’t how to do so before (which is true to some degree), it is also because people looking at those paintings didn’t necessarily know how to interpret those three dimensional perspectives. Our ability to see and process such images in our brains has evolved too. The same is not true for my cat. If I could get my cat to focus on a photograph of a good looking kitty, he would sadly not see that pin-up kitty. He would see a mess of colours on a piece of paper. His brain cannot translate those colours into an image – let alone a three dimensional image. Our brains are key to all this dimensionalist stuff. Let’s test our brain. What do you see below? A bouncing ball, right? Yep, that is what it is. A red ball bouncing up and down along an imaginary line, i,e, in 1 dimension. It is a relatively complex movement that mathematicians call sinusoidal. But since we are clever, we can turn the camera over and look from the side, we see a much simpler perspective of that same moving ball below: a simple rotation in two dimensions: same ball, different perspective. So, dimensions are all about perspective. The same thing may look very different depending on the angle you are looking from. Enough of the preschool animations. Bring on the genetic fractals 🙂 Here is one I made earlier. The lighting and rotation give an illusion of three dimensions, which is just fine. Don’t stare too long as you might be lulled into sleep. So how would we see the fourth dimension if we bumped into it? Let’s do a little mind experiment and pretend we are Einstein, or Zweistein even. Consider a square piece of cardboard. Paint it pink or blue or pick a neutral colour. Now imagine 6 of those and with some scotch you make a box out of this. This requires some dexterity but since we are doing this in our mind, you should manage without wasting too much tape. Now just for fun, we’ll paint the different side of the box with different colours or stick photos on them. Got it? Now go and play with the first piece of cardboard and the box. You will quickly tire of turning the cardboard over whereas the colourful cube can keep you busy until tea time. Did you enjoy this? How weird is that? Although you are turning this genetic fractal to you hearts content, it looks like it is flattening and expanding. But not turning. This is because one of its three dimension is turning into the fourth dimension and disappears from our view. But it hasn’t deformed, it is exactly as it was. Only our perspective has changed. Now ask yourself: have you ever seen a thing moving in this way? I bet you have. This expanding and contracting is quite a common thing. At our sunday market here, there is a french guy with a beret who plays the accordion. But do you think that he knows that every time he compresses his accordion, that it partially disappears in the fourth dimension? I bet you he doesn’t. He is more interested in the coins that drop from heaven. He is quite good, actually. Okay, I can tell you are not convinced. You were happy enough to accept that a bouncing red ball was actually a rotating ball even though you couldn’t see that from your perspective. Fair enough, they don’t teach the fourth dimension at preschool yet. Just to test the limits of your patience. Below are two genetic fractals as before but at a straight angle with each other. One starts with one dimension in the fourth dimension and the other starts in our worldly three dimensions. Now, don’t try to work out what is going on here: the takeaway is that there are two static objects rotating in four dimensions. For three-dimensionalists such as ourselves, it looks like stuff is expanding and disappearing but there is nothing of the sort, these are just rotating objects. Here is the cracker: whenever you see things in three dimensions that make smooth contractions and expansions in various directions, you have a pretty good chance that you are observing a four dimensional rotation! I mentioned starling murmurations in my previous post. I was a little cheeky because these are more like fifth or sixth dimensional rotations of a static formation of birds, but I didn’t want to over indulge in your patience. If you are a physicist, you’ll either click unfollow now or you might be heading for the comment field. Hold your horses! Yes, I know that in these examples the fourth dimension is non-spatial and might be water pressure or momentum. But ask yourself, have you ever thought of them as a four dimensional rotations? And when you do, how does that change your view of an object when this view tells you that water pressure, for example, is one of the basic dimensions of an object and not just an additional parameter? Now, go to the comment box. Okay, I suspect I have confused you enough. I just hope that someone can replicate this experiment or else, I will face reputational ruin in the face of those I hold in high esteem and the NSA. ← Oh, grow up out of your preschool dimensions! So, what does the dog think about all this? It is quite possible that they are 6 dimensional aliens of which the part that protrudes into our 3 dimensions looks like a dog. Who knows what they say about you on the higher end. Yes, that is my take on this: out perception and observation is limited, not the number of dimensions out there. Thanks for the editing hint – I was shocked how many errors there still were! Happens, especially when you’re writing something that excites…and I think I can agree, as in most thing we are limited…it’s like the cat, no…just because he only sees blotches on paper and can’t use our neat trick to decifer them…doesn’t mean the trick can’t be done. The number of dimensions many just be so much fuffa in the end…something to play with? Complicated toys…but they look like a lot of fun…and you have a great way of explaining so even I, who has never entered this field can pick something interesting up and have fun to boot! This is so great! No way I’m unfollowing your blog. Exactly: if you have a pressure that increases and decreases periodically, this can be modelled as a rotation of some other angular quantity, just like in the harmonic oscillator. Never thought of it like that but it makes perfect sense! I really love it when posts make me think this much. Brilliant. Thank you very much for this. I’m glad that a physicist read this copernican thinking. I was worried that the inquisition was about to knock on my door! I’m still walking around with your tree experiment on my mind – not right now because it’s raining – and I took your first article on this very seriously. I’m slowly learning that higher dimensions are learned gradually. It can be done but it takes time. Life underwater is far weirder than that above. With the virtual absence of gravity nature can do exactly what it wants. Jellyfish, (living) shrimps, soft corals – amazing. I agree that the genetic fractals are similar. Good observation. Thanks! I think I see where you’re coming from, Henk. Here’s my attempt to replicate the experiment. Let me know if I’m on the right track. I am late to this (as this post of yours coincided with the beginning of my “blogging break”). I’m on a break myself and remembered that I need to try out the 4th dimensional model for 1 dimensional oscillations. Thanks for the thumbs up! But what that shows is how a 1 dimensional linear (harmonic) movement is in fact a 2 dimensional rotation. What you need to look for is oscillating movements and ask yourself where is the rotation? The water filled balloon thrown into the air is an example of such 3 dimensional oscillating movement.Sometimes you can see the balloon rotate like a disc but if it just bulges in and out then the rotation has shifted into the 4th dimension. You are seeing a 3 dimensional projection of a 4 dimensional object but … your brain isn’t ready to ‘see’ the 4 dimensional shape. The examples on this page show rotations of STATIC – objects. They not really contracting and expanding but that is what it looks like to us. I’ve been thinking about this since yesterday and I feel like I may have “experienced” this forth spacial dimension in my mind’s eye. After reading about your tree-walk-by exercise for glimpsing the fourth dimension it immediately reminded me of the experience and I completely related to what I think you caught a glimpse of… or perhaps it’s simply my imagination. Time will tell I suppose. But I digress. Last 4th of July I took the kids to see the fireworks at the local park. We chose a nice comfortable spot and settled in. It was a very dark sky that night and as it turns out our “great spot” gave us a great view of the fireworks right through a large tree. I asked the kids if they wanted to move, undaunted they dismissed the idea as absurd. We had a great spot after all! So, we viewed the nearly hour-long display with a tree directly in the center of our visual field – perspective. About a half hour into the pyrotechnic display the sky became saturated with smoke created by the fireworks as there was no perceptible wind at the time. A few minutes later a very cool, stiff breeze moved in. The display was now picking up intensity nearing the grand finale, the breeze picked up even more and the tree we were staring through began to undulate with the now cold brisk breeze. The effect of the bright lights coming directly from the fireworks, the “flash” sometimes strobe-like indirect lighting effects of the fireworks reflecting off of the smoke canopy, the undulating branches and twisting/fluttering leaves and the sound the tree was making (yes, it was the solitary tree within a 30ft radius) gave me the feeling of experiencing each minute part of that (constantly in motion) tree in all possible “forms” all in the same moment. The feeling continued from moment to moment but the “forth dimensional image” I was seeing in my mind’s-eye (very similar to a “ghost pattern” after visualizing an object in motion) was very reminiscent of murmuration as you’ve described in flocking birds and the experience was similar. The “sound” definitely contributed to the experience and I remember distinctly concentrating on the sound of the wind moving through the branches while the light and shadows danced within the tree structure. I felt as though in my mind I could “see” the entire tree (as if from all angles and not as a spectator in one point in space) but also could sense the entirety of the tree’s “potential spacial” states. The experience reminds me somewhat of what people describe as an out-of-body experience while in surgery and in those cases they can see everything as if detached from their body. It’s sort of as if I could “feel” the 3D branching as I stared through it and concentrated on its’ movements and sound. I’m not sure if that was a forth dimensional glimpse or just an illusion but it does at least serve as a metaphor to help me understand the concepts of four dimensions. Excellent description Mark; that is exactly what the experience is like. The circumstances you describe would indeed create that experience or illusion. We cannot directly experience the 4th or even the 3rd dimension; our brains have to reconstruct these from two separate images. When the brain manages to snap the 3d scenes into 4D scene you definitely notice it though it may not always be clear what ut is yiu notice. I think that you drew the right conclusion. Awesome; thanks for describing this. Now I need to start playing around with stroboscopisch light. That should indeed work! Thank you for your work and resources on this subject, it has been a real eye-opener for me and I think you’ve made some real insightful observations about experiencing this phenomenon and understanding it. I agree, the lighting effects really brought into focus the 4D experience. Both the effects of bright lights behind a dark tree canopy and the stroboscopic nature of the flashing contributed to an ideal representation of the 4D experience. As you’ve suggested repeatedly in your writings the movement I think is also critical – until the wind picked-up the effect was much less intense. Something about the shadows and the movement of the leaves and branches in a swirling (not unidirectional wind) motion very much enhanced the effect in my mind. Another thing to point out, and I think it may be an important factor, is that the leaves were relatively small and of a density that allowed light to pass through the entire canopy (as seen for example in examples of starlings in murmuration). I doubt the effect would have worked nearly as well with say a large-leafed maple or oak tree. The “just-right” density of the leaves and branch structure allowed me to “see” the entire branching structure of the ~ 20′ tree at all times (as with the birds in a flock). The sound of the breeze whipping the tree also made a distinct impression but I’m not sure if it directly played a role in creating the 4D effect or if it simply enhanced the experienced after it was already in effect… but I think there may be something to it. You’re absolutely right, it’s not that I saw in 4D, it’s more that the visual effects allowed me to create the 4D image inside my imagination as they were in effect. I’ve tried the tree walk-by experiment and I think I sometimes get a brief glimpse of the effect but it is very fleeting. The method by which I experienced it allowed for me to feel it for extended periods and to “focus” it. I think the walk-by method requires some real luck to “see” it partly because of how brief the window to see it is. I probably had a good 5 minute window where I was able to experience the effect and I recall the effect did in fact come more into focus as I adjusted my stare, where I focused my vision, and allowed my brain to transition to the effect. It essentially felt as though it came in and out of focus just as if trying to isolate a star in a telescope to get the ideal view. I should mention that my girlfriend also experienced the effect and she wasn’t even looking for it. In fact, even my kids were mesmerized by the effect so I don’t think you have to have any special characteristics (other than perhaps an open mind!) to experience it. That’s good news if true. Great work, keep it up I’ll be keeping an eye on your progress! I’m currently doing research in hyperdimensional computer graphics and was interested to see your 4D animations. May I ask how you created them? The ones in this post are somewhat trivial: the rotation takes one of the 3D dimensions and rotates it into a 4th dimension, i.e. it disappears. But they are 3D objects so nothing comes ‘back’ from the 4th dimension. 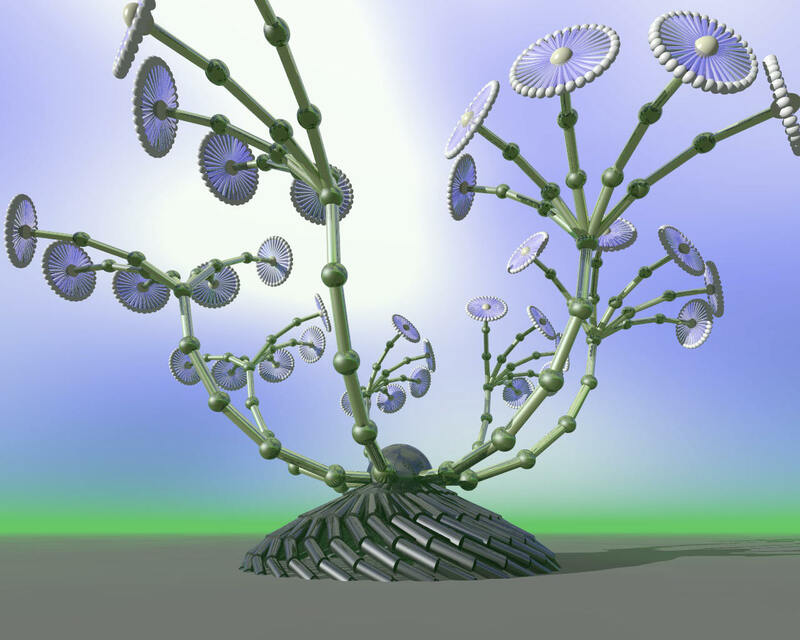 A lot more interesting are the 4D and 6D rotations in a blogpost: https://geneticfractals.wordpress.com/2014/11/12/making-sense-of-a-four-dimensional-tree/ and https://geneticfractals.wordpress.com/2014/11/30/grappling-with-shadows-in-the-fourth-dimension/. These are genuine 4 and 6 dimensional objects that are rotated through a 3D window. The trick is to create a 4D object and rotate it in a plane, i.e. swap the invisible 4th dimension (v) for one of visible x,y,z dimensions. So rather than plot x,y,z you plot x,y,z*cos(a)+v*sin(a) where a is the rotation angle. You can do more complex rotations than that but I find that simply rotating the v dimension into view by ‘ swapping’ it with the x,y or z will give a reasonable view of that 4th dimension. The rotations I have shown here are mainly possible because I have a model for hyper dimensional tree objects. Refer to http://www.geneticfractals.org for all the details. You can use hyper cubes, hyper spheres etc but you’ll have to model them first. So did you use some off-the-shelf 3D software to render the animation? Or do you have some other animation/rendering tool? I animate & render in 3 steps. First I create a series of coordinate files, each of which has the xyz coordinates for all the elements of the object (sphere, cylinders etc) for one particular rotation angle. I then use POVRay to render each of these coordinate files into ray-traced images. Then I turn that set of images into an AVI. There are different tools for this but the last time used GIMP to make an (big) animated gif that I then turned into an AVI which I converted into a YouTube vid. You can probably do all of that in Blender if you know what you are doing and if your PC can cope with its memory usage.